My apologies, this was scheduled incorrectly. 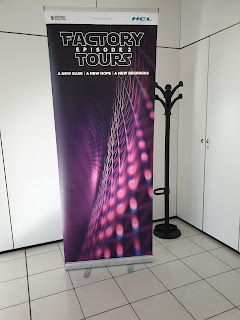 If you were not at the HCL Factory Tour Part 2 recently in Milan, you may not appreciate all the Star Wars references but, us being geeks, we go with the flow. There were about 100-120 customers, business partners, and IBM Champions in attendance, many of us worn down from travel to/from Think in San Francisco barely 10 days ago. 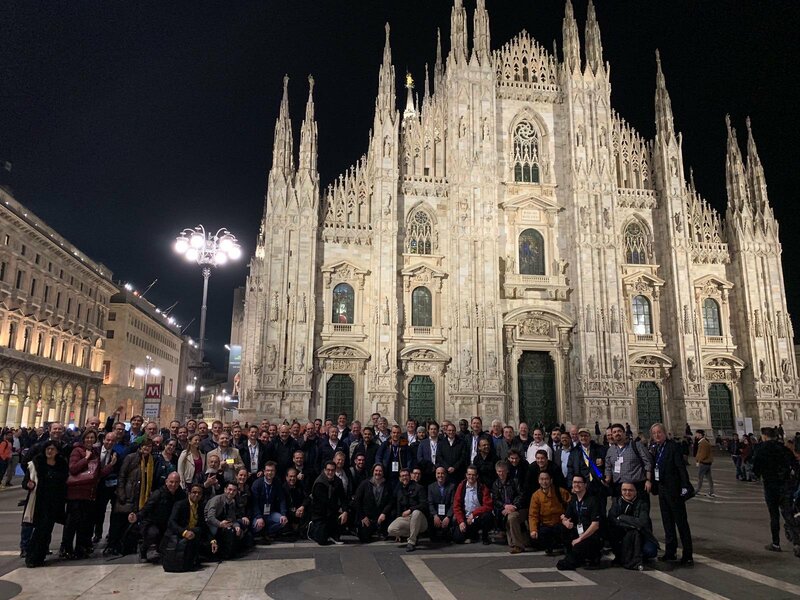 We converged on the HCL offices in Milan, Italy with Richard Jefts and his crew of ex-Empire leaders. We proceeded to have 2 full days, 3 if you stayed for Portal day (I did not due to flight schedule) of sessions. Myself and a few other IBM Champions were tired from all the learning. We are used to doing the sessions not attending so many in a row. I messaged my kids at one point that I was reminded how they feel every day at school, been 26 years since I finished my MBA. There was a track for technical and a track for Business. I skipped the developer sessions, I am sure my developer friends covered that stuff very well or will soon enough for your review. Business partner sessions, sales sessions, HCL services, the future of the Champion program session, and some other ones I can’t really discuss publicly, as much of it is not written in stone until the deal is finalized and should properly come from HCL itself. However, we did get to weigh in on many aspects and I think the partner community will be quite happy. 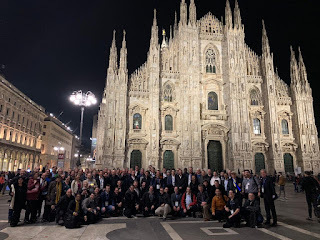 We also had the pleasure of walking around Milan on our way to dinner the first night, and as you can see from the picture below, we all did a group photo at the Duomo in the center of Milan. 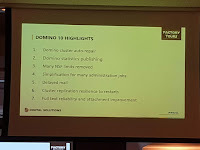 Thanks HCL for a great time and, my luck, got to spend time with Russ Holden at my table who now heads all Notes and Domino development (maybe more, but if you know Russ, then you know it is in great hands) and Richard also sat with us but, as the host, was quite busy. So what can I tell you? Let’s talk about the current and future of Notes Clients/Verse, Sametime, Nomad, Places, Technical Advocacy (near and dear to my heart) and closing speaker @VoWe. 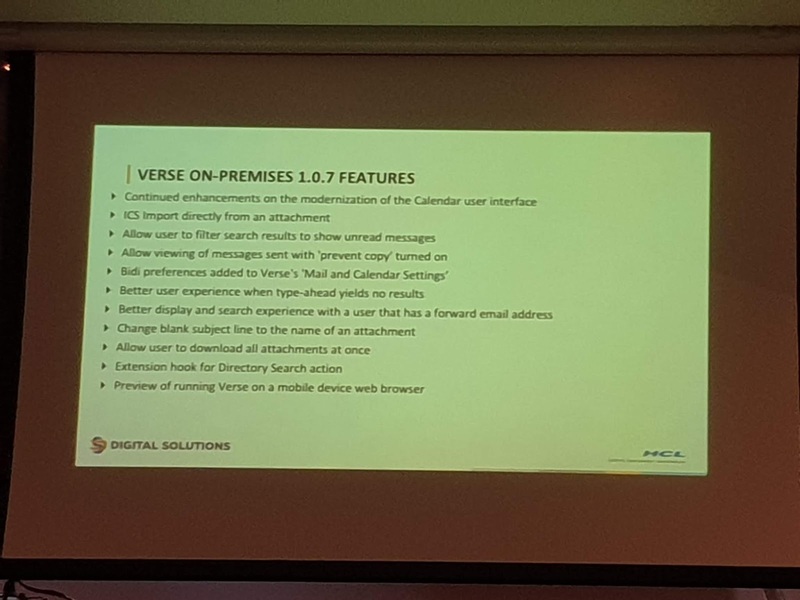 V10 highlights on the left graphic and Verse on Premises upcoming Features and you can read them on your own. 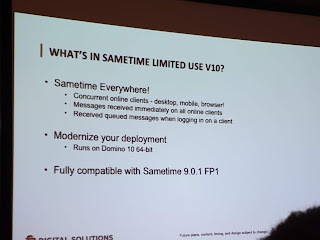 An interesting highlight, for me, is while web browser apps will maintain all languages, Notes and Domino and on premises applications are going to lose some languages, including Hebrew. So if you are from a smaller country, you may want to verify there will still be a client in your language. It is a monetary decision based on licensing and number of users. I hope to change their mind, will see. 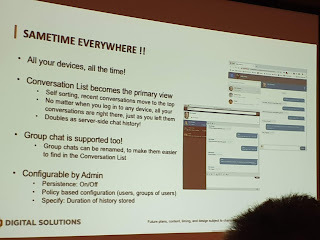 There was some discussion about a mix of Verse and NOMAD, the application to read your Notes applications(except mail) via a browser and not the old NOMAD of running Notes from a USB. Ideally it would be good but doesn't sound like a true panacea just yet. V11 Notes client is shaping up. Plans are to do a release a year (YEAH!) and over time make it easier to update your clients. There is of course the Verse client that was meant to be light weight and the “future”, but undoubtedly, due to key customers, the Notes client as we know it, java et al, will continue on. Not surprising, the UI teams efforts, while clean, were reminded that the, ahem, elder employees, need more contrast schemes. It looks a little cleaner, some things are getting reworked and less “html section” like so the UI appears to all be one window. There will be a release, the Limited Use V10 version out soon. As you can see below some of what is included but the main item is Persistent Chat is part of it. 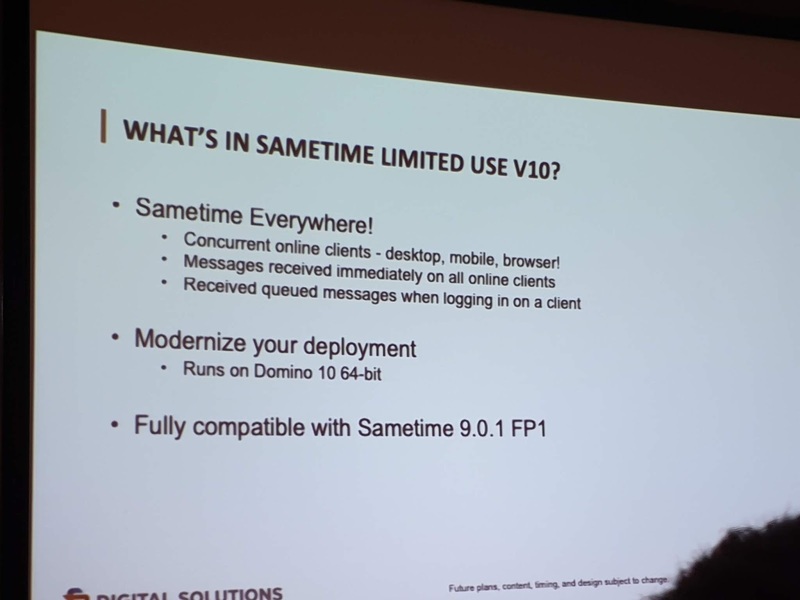 We will have to wait until the end of the year for the next full version of Sametime which will also be numbered in synch, and possibly emerge, at the same time as Notes and Domino 11. 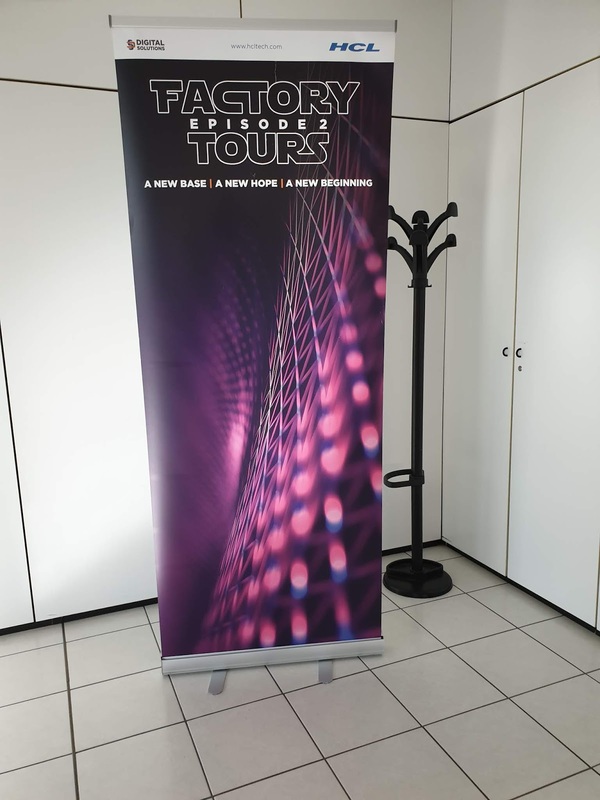 Unfortunately we did not get the previews of the revised templates coming but it sounds like at Engage, in May in Brussels, they may appear. The team was quite surprised but our enthusiasm to see/hear and give feedback about some core templates in need of modernization and not just UI. 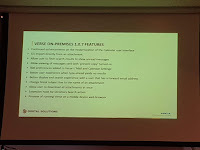 At the end of the 2nd day, Volker Weber gave us a history of Lotus coupled with his take on the HCL/IBM deal and future. Always great to see him and spend some time talking with him. Overall, what I heard and saw was impressive. Yes some items are off limits until the deal closes but you can see the fun is back in people's eyes, something we have been missing for quite a few years now. Now to see if the tide can turn and give Notes and Domino a Renaissance like when Steve Jobs came back to Apple. Sadly I know from experience only 5% of you will follow through on this, but here it goes anyway. If what we have been doing all these years in the Domino space did not change anyone’s opinion, why should it now? The answer my friends, is it can change, only if we change. When I set out writing this blog, over 1,000 posts ago, I had started and stopped a few times while I found what was missing in our YellowVerse. The Evangelist. IBM did not, and in some ways still does not, provide the information people in companies today need to help them keep their jobs, and thus IBM hardware and software, soon to be HCL software. The SWAT teams, the Tiger teams, the Men in Black (I was one) did not publish anything public over the years. They were probably not allowed (?!) and so it happened that IBMers told me to keep writing and doing more, because their hands were tied. The only exception, was when Antony Satyadas ran his "Project Liberate", to compete against MS, which was really about price points. His efforts were the closest anyone came to really pushing back against the world and promoting Notes & Domino. Sadly that was short lived and in 2008 and 2009. As we know, the CXO never chooses a product because of functionality, and rarely on price alone. So what do I want you do? I want you to earn your IBM Champion (hopefully soon to be HCL Champion) status by being the person that your company needs, wants and relies on, and not in an the usual administrator or developer type of way. 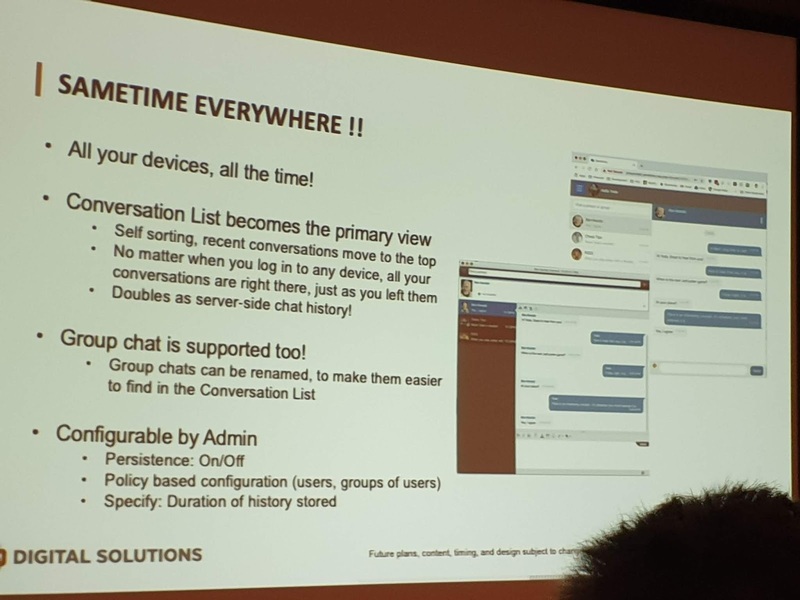 Your mission, and you really have no other choice but to accept it, as you will see, is to make every.single.person in your company know what Notes & Domino, Sametime, Traveler, Connections, etc. do for your company. If you have Connections or Sharepoint it will be pretty easy to accomplish this task. Stealthily or upfront, makes no difference, you can do this, and you will, we will get to why you should do this soon enough. Afraid your boss will go crazy on you? You are making them look better, even though they will say otherwise. Tell them you are helping their cause by asking for more budget to support all the great applications. Your peers will think you are crazy….until they “get it” and start doing it themselves for their own applications and areas. You need to start simple, here are some ideas. What does this application really do for our company? Does it onboard people or make the process easier/faster, manage passwords, handle expenses, payroll, sales, marketing, audio/video, PR, manage executives calendars, etc. How much money does this applications make the company? 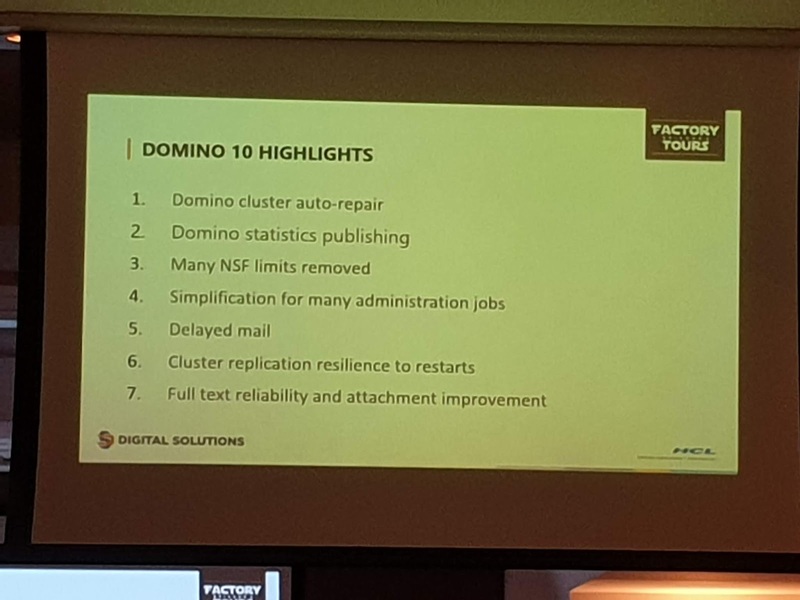 There is a reason Fortune 100 companies still run Domino applications inside their world, because they are critical to their businesses. Alternatively how does this application save us money/time/resources? If not, you may want to raise a new project to your boss to retire some older ones. What applications could benefit from some new coding or UI/UX? Why raise the downside? Because if the app is so meaningful, it should be treated like an Enterprise application, not a back office cast off. Going Cloud or staying on premises can also get the same treatment because there is a reason you have chosen to go that route. Support ticket updates. This can be tricky but important. If you know that you have rarely seen repeat tickets from users, this is a high rate to promote yourselves as permanently fixing issues. You may see how many people you supported in a month, or a year, and realize your reach is much more than you thought. There are unlimited possibilities for you to provide these “status updates” or blog posts or wiki details inside your company. Talk about the data, the business value, the greatness that you love. Start with one item, alternate every week or every few days. Explain it in business terms and in your own way. You will slowly get feedback, and followers. You will also get complaints and enhancement requests, both excellent feedback for you and your team. If you know how to respond to the complaints, do it, if not, ask me or one of the other bloggers or IBM Champions. You may get known as The Notes Guy or Lord Admin or Domino Guru or Lotus Evangelist. And that is always a good thing for you. You may also want to share and discuss some of this with your IBM/HCL or Business Partner representative when the opportunity arises since they can help you further. Your job is at stake. Every single day/week/month/quarter, maybe not now but down the road, if you don’t do the above “promotions”, your management, and your users, dream up ways to get some other product brought in to be used because they don't even know what they own or run. Not fair? No, it isn't, but you need to fight back and find a way to get the word out. If your company does get that far, guess who is probably out of a job? You might get retrained, but so far, from my view, that is about 25% of the time. Not good odds. It will be hard, you will get flack, and you will think no one is reading it, and you might be low on the totem pole, but if you have tagged the posts well and sprinkle in some magic terms that relate to your company business, you will start getting noticed. Be prepared, don’t just say you were doing this for fun, or because I sent you, provide your mission statement. “My job is to do the best I can for the company and encourage management in their efforts and by providing this data I believe will make us a better company”. No double speak, no BS marketing mumbo jumbo, no buzzword bingo, just straight and to the point. Nothing hurts as much as an ignorant executive make a choice that may not be in the best interest of their company without pointing out to them what their business value is, and why they have it. They don't know, often don't care, and that is why this is so important of a task I assign you. This is not a technical battle front, it never was aside from the early days because no one did anything like Notes. Yes, we have new goodies inside R10, and down the road R11, but those need to be put in business benefit terms, as I have written about previously. So, are you going to save your job? Going to be a part of the next generation of Domino applications in the world? Become an IBM/HCL Champion next year because of what you started this year? Or going to live in fear forever. Need help? Reach out to me through any number of ways from my blog or other ways. I am easy to find. I fly in from Israel, via Boston, Sunday and spending it with my cousin's new baby. I will see some of you early Monday morning at the Champion breakfast. For those in the Champion sessions I will be giving a Lightning talk along with a few other Champions from across IBM. Wednesday morning I am presenting my customer Case Study, in an open format to encourage people to ask questions rather than talk about the good, and bad, things we did. Slides will only be used if you don't ask questions. Aside from these defined events I will be roaming around and the best way to find me is via Twitter (@Lotusevangelist), what's app/call me (ask me for the number), Facebook Messenger, or if you are in one of my workspaces, Slack. I am leaving Wednesday night due to other plans in Boca Raton, Florida and I hope to see you all before I leave. If you want to catch me in Florida let me know..
Bear with me here, this is a ramble on kind of post. Nothing like this one was. Never thought I would be an author, but the chance came along, I took it and I have an author's page on Amazon. I never made it to the cover of Rolling Stone, actually I never made the cover of any magazine. However, I was included in articles in CIO magazine and many other websites over the years. Had some newspaper articles written about me, got included as a case study in how to grow a community on Linkedin in an executives book. Turns out I wrote a few IBM Redbooks with people over the years, in return IBM made me a Redbooks Thought Leader. We did the first Redbooks video from the community to IBM at the time, because I wanted to give back for all the help I had received over the years. Somehow I have written over 1,100 blog posts. When the muse is loose, run with it. Got my name in Playbills, actually quite a few times, while I worked on Broadway. Best time of my life, aside from Ron Perlman (at the time doing A Few Good Men)looking like he was going to kill me when he was running to 2nd base during the Broadway show softball game. Stories of people I met while on Broadway could fill many posts, it was also when the Berlin wall came down. Traveled all over South America and Europe, thanks Citibank and IBM. Got sent to Venice, Italy, for work, not once, but twice. Best place on Earth, I proposed to my wife Vanessa while there with her, not on business. Live tweeted the Palm Beach Opera, for 2 seasons, that was fun and free, hope it helped their ticket sales. I miss my '62 vette, should never have sold it. I also miss the 3000GT. Worked on Wall Street for a few years with Bankers Trust which became Deutsche Bank and in the World Trade Center on the 44th floor for Bank of America. The Wolf of Wall Street movie was pretty accurate for that time period. Lived in London for 3 years while working for Lotus and wrote a Pantomime that was performed, I played the Godfather character. Had a great boss at Lotus and friend who recently after 49 years left IBM for HCL. I should never have let him down and left the team, but that is how life works out sometimes. Moved to Boca Raton to be near my grandparents and mom after leaving IBM, got cable TV installed just as the 2nd plane hit the World Trade Center. Started a business that was going to do $3 million in sales until our supplier stopped working with small companies. I tried to buy them in an auction, I lost to a VC firm by $25million. They turned around and sold it for $900 million. No thanks to GE capital who would only offer $50M. Yeah that hurt. Worked with Burger King at their World Headquarters, twice in Miami, the 2nd time because my name was still on the names.nsf log from years prior. I was in Caracas, Venezuela just weeks before Chavez took over. Been on planes that engines stopped, caught fire, parts fell off, and had bomb threats, just another day of traveling when you are a road/air warrior. Survived my teenage years and my college life, somehow, pretty sure a few people never thought I would, I never gave it any thought but to those that worried, surprise! Worked the field at FIRST Robotics events as a robot inspector and helping kids understand there is more to life than the internet, school or work inside of them. Mentored startups at MASSChallenge Israel the last 2 years and saw some of them get to the finals, others get funded and more succeed beyond their wildest dreams. It is a great feeling knowing you helped in some small way. I was fortunate enough to be an IBM Champion since 2013. And thus listed on Wikipedia. My kids are impressed, the rest of the world, not so much. My 3 kids have no idea what life was like before they came onto the scene. It is like a different world, times change, some things stay the same. I used to make an awesome Beef Wellington. Never thought I would Home School my kids, but I did for 2 years. They claim to remember things I taught them so it was not all wasted time. Brewed beer once because everyone should do it, but my friends who still get to do it regularly are living the dream and I am happy for them all. It was while home schooling that I started the Daf Yomi as they started the new cycle, and 7.5 years later it will finish next January. You can have your marathons and mountain biking, this is mine. Owned Amazon stock in their early days and sold it after it doubled. HUGE mistake. Once parked my car up a staircase. Tequila bowling in college. Sorry to the guys at the end of the hall. One of my first public presentations was in front of thousands of people at Lotusphere Europe and I have enjoyed every presentation I have given over the years since then, be they business, technical or educational in person or online. For better or worse I have worked for myself all these years since college, aside from 3 years at IBM, 2 years with an IBM Business Partner and usually from the comfort of my home. I have all the trappings of young startup offices, Pinball Machine, books, loud music, my dog at my desk, open fridge and bar, video games, MAME and puzzles and games. I have moved countries 4 times and pretty sure I am staying put here in Israel, but I can commute to anywhere in Europe pretty easily so what's not to like? Even volunteered for army duty for a week because that is what you do in a country where every person matters. If you made it this far and still reading, you probably have stories from my past we shared together and hopefully we will get to share more of them over the next 50 years or more and some of you I will see soon in San Francisco. Thanks to Vanessa and my kids for trying to keep my young and fun.